After over a year in Moscow pretrial detention facilities and multiple hearings in Moscow’s Basmanny District Court, Nadiya Savchenko was informed of an impending transfer to another pretrial detention facility. The exact location was not specified, but it is safe to assume it will be close to the town of Donetsk in Russia’s Rostov Oblast (not to be confused with Donetsk, Ukraine). 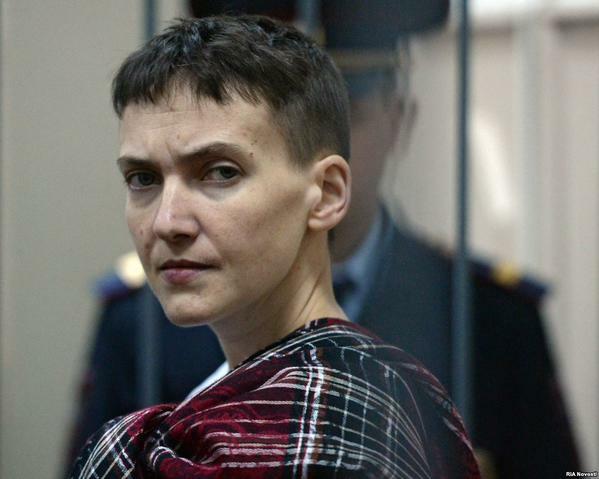 The proceedings in Savchenko’s case were transferred to a court in Donetsk, Russia. As it is a borderland area, any foreign nationals are only admitted there by permission of the FSB. Today, July 15, 2015, I was informed that the court hearing on the charges of murder of the Russian journalists that were presented against me by the Russian prosecutor’s office was scheduled to be held in August 2015, in the town of Donetsk, Rostov Oblast, Russia. That town is the main center and transfer hub used to ship Russian weapons and pro-Russian separatists of the so-called LNR [Luhansk People’s Republic] and DNR [Donetsk People’s Republic] to the territory of Ukraine. The place is permanently filled with thousands of people, including armed ones, who are going to wage war in Ukraine against the legitimate Ukrainian authorities, or [who are] returning to Russia. My attorneys are constantly receiving threats from LNR and DNR sympathizers. The lives of my sister, Vira Savchenko, who is the main witness for defense, and my mother, Mariya Savchenko, who wants to be present at the trial, will certainly be in direct danger. Furthermore, according to the Russian legislation, they can be denied entry to the borderland area by the FSB of Russia, as foreign nationals. The same applies to members of the Ukrainian Parliament, PACE, and the European Parliament, if they wish to be present at the hearing. All injured parties, witnesses, experts and professionals, as well as my attorneys – that is, all persons who must take part in the hearing – live in other regions of Russia or in Ukraine. It was claimed that the Donetsk court has jurisdiction over the entire case because I, allegedly, illegally crossed the Russian border in that area on 06.23.2014, even though the baselessness of these accusations is obvious and has been recognized by the competent Ukrainian authorities, who established that, from the moment of being taken captive by LNR militants, I was not free for a single moment, but was handed over to Russian investigators by the separatists. The competence [and jurisdiction] of the Donetsk court has no relevance to the substantive charge, namely, the murder of Russian journalists. Taking the above into consideration, I believe that the decision of the Russian prosecutor’s office to transfer the hearing of my case to Donetsk was made with political purpose – namely, to prevent my defense from operating as normal, and to interfere with the media coverage of the trial. Russia is also ignoring the immunity from arrest and detention under Article 15 of the General Agreement on Privileges and Immunities of the Council of Europe, which I have as a PACE delegate. I ask you to appeal to the Russian authorities with a strong request to ensure normal and safe conditions for the court hearing, specifically, to move the hearing to a court in Moscow. According to the resolution of the Deputy Prosecutor General of the Russian Federation [Viktor] Grin, which was made available to me today, proceedings in the criminal case N 201404091-15 against me were transferred to the municipal court of Donetsk, Rostov Oblast [Russia]. Taking into consideration the current situation in the borderland regions of the Luhansk and Donetsk oblasts of Ukraine, I believe that holding the court hearing in my case in a de facto combat zone creates a serious threat to the life and health of my defense attorneys, my sister Vira Savchenko, who must be summoned to court as the main defense witness, and my mother Mariya Savchenko, who is going to attend the hearing. I am aware that due to the biased and false presentation of my case in the main Russian media channels, sympathizers of the so-called DNR and LNR are personally hateful towards me and anyone who defends me. Donetsk is the main transfer hub and supply base for pro-Russian militants fighting in the east of Ukraine and those heading there from Russia. I do not believe that Russian authorities are able to adequately ensure my safety and the safety of other participants in my trial, in a location like Donetsk. Furthermore, all expert analyses in my case were conducted in Moscow and none of the injured parties in the case permanently resides in the Rostov Oblast; therefore, the summoning of injured parties, witnesses, and experts to a court in Donetsk will be objectively complicated, and their failure to appear in court will mean a violation of my right to defense. In the near future, my defense attorneys will submit a petition to change the territorial jurisdiction of the case to Moscow, as per Article 35, part 2 of the Criminal Procedural Code of the Russian Federation. On my part, I request that you pay particular attention to the situation I described, interfere in it according to the procedure provided for by law, and amend the previous resolution that established Donetsk as the jurisdiction of the case. This statement is submitted by my defense attorneys, through the reception of the prosecutor general’s office. This entry was posted in #Free Savchenko, English, English News, Pictures, Video, War in Donbas and tagged #FreeSavchenko, #freesentsov, #RussiaInvadedUkraine, #StopRussianAggression, #UkraineUnder Attack, Donbas, Donetsk, Slovyansk. Bookmark the permalink.